Our business is communication. Frank Elsner Kommunikation für Unternehmen GmbH (FEK) advises and supports companies, entrepreneurs and top managers in positioning themselves in public and navigating through an increasingly diverse and turbulent media world. We develop strategies for establishing and maintaining strong and reliable relationships with capital market participants, employees and business partners. We work for clients whose strategies and goals we clearly understand and can credibly represent. Particularly in difficult business phases, we are strongly committed to preventing damage from being done to our clients’ reputations on the capital market and in the general public and create new ways for them to take action. Last, but not least, discretion is one of our core principles. That’s why you won’t find long reference lists or literal PR testimonials on this website. Details of our work are reserved for personal discussion. That can’t be replaced by anything else so we kindly invite you to contact us. To start with, however, we want to acquaint you with the principles we believe in and adhere to in our work. FEK is an owner-managed agency that specializes in professional external and internal corporate communication. Founded in 2001, FEK has offices and teams in Westerkappeln near Osnabrück and Munich. The spectrum of clients we have been serving for over 15 years in some cases ranges from medium-sized family businesses to internationally active and listed corporations in a wide variety of different industries. Engaging in direct exchanges with owners, Board members and Managing Directors is indispensable for our work. Of course, we also work very closely with press offices, investor relations managers and marketing departments. Our main focus is on corporate and financial communication. This includes coverage of mandatory communications for listed companies, the conception and drafting of quarterly, half-yearly and annual reports, for example. We would be happy to share examples with you in a personal meeting. We are happy to act as the official contact for the media, analysts and investors, but are also prepared to work in the background if necessary. FEK is known for maintaining long-term relationships with its clients, in some cases for more than 15 years. This doesn’t rule out temporary mandates, however, as long as we can make a valuable contribution and live up to our own standards for professional corporate communication. On a case-by-case basis, FEK partners with long-standing communication service providers who increase the contact and access network for our clients and create additional scope for action. Companies and organisations communicate constantly – with their customers, suppliers, employees, managers or financiers. This is just as important for medium-sized companies as it is for large international corporations. Therefore, companies and organisations, especially those of a certain size, level of awareness and market significance, need to define what they are all about and how they want to be seen – from both the inside and the outside. Companies that refrain from talking about themselves risk having others talk about them. Those who do not create their own identities will sooner or later have them created by others. In a digitally networked world in which rumours and speculations can be spread within seconds, the damage to a company’s reputation can be significant. This makes it all the more important to have someone at your side who can help you to take professional action against unjustified accusations, insinuations and rumours. Corporate Communication supports the goals of a company – no more and no less. It conveys messages to important target audiences about values, people, unique skills and products. Communication is a long-term task, because only then can it have a sustainable effect. So, as this illustrates, Corporate Communication is neither marketing nor advertising. In many cases, its success cannot be measured by the number of articles published or user activity in social media channels. Good communication can also mean deciding not to communicate in a certain situation or communicating very cautiously. Every situation is different. Solid skills, experience and creativity are the prerequisites for mastering them. Communication is a strategic management task. Therefore, for us, constant communication with owners, Board members and Managing Directors is indispensable and irreplaceable. Such frankness is the prerequisite for target-oriented communication. We will always give you a recommendation as to what the best solution could be, based on our experience. And we will tell you just as candidly if we consider making a certain move unwise. In other words, we don’t always make it easy for ourselves or for you. But good communication solutions are rarely found in manuals. We love to talk about our clients as long as it serves their strategic goals. Nevertheless, we feel that publishing long reference lists cannot be reconciled with our understanding of discretion and trustful cooperation. We certainly don’t want to present ourselves on this website at the expense of clients whom we have helped to communicate in very difficult, sometimes existentially threatening situations. We would be happy to give you an overview of previous and current mandates in a personal meeting. Our founder and Managing Partner Frank Elsner was born in 1968 and has been in the communications business for more than 25 years. 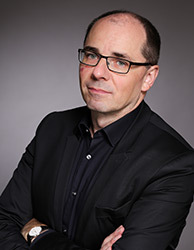 After studying journalism at Ludwig Maximilian University in Munich, the graduate of the German School of Journalism worked as a business and financial journalist for renowned daily media for around 10 years, most recently as Senior Editor of the financial newspaper “Börsen-Zeitung” in Munich. Frank Elsner went into the Corporate Communications business by founding FEK in 2001. His theoretical and practical journalistic background has proven to be extremely helpful for successful communication work in numerous mandates.